When I was growing up, it always felt like the engineering crews of the various Enterprises were limited by their imaginations more than their effort. Systems were clean and efficient, and often could be re-purposed to perform other functions under pressure. Where was the dirt, the chaos, the “what do you mean we’re going to die now?” realisation that an out of control fire was destroying everything? For something with more of that feel, step forward Starship Mechanic, on display at EGX Rezzed last weekend. 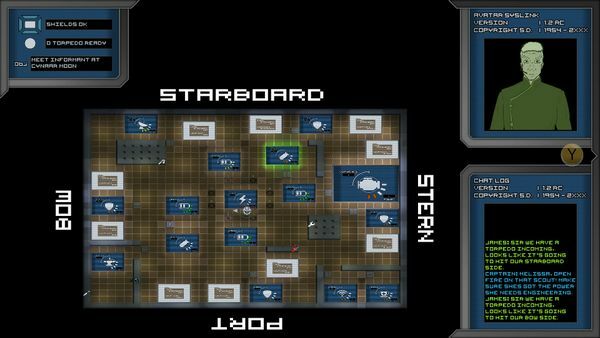 The first game by Resonance Studios, Starship Mechanic puts you into the lonely – and overworked – boots of a mercenary spacecraft’s engineer. Physically isolated from the rest of the crew, your role is to keep the systems everyone else needs up and running. Naturally, this is hindered by the expectations of everyone else that everything will be running optimally, rushing into combat with enemy craft who naturally don’t have your desire for an easy day as a priority. Viewed from directly overhead, you are free to move around the engineering section, and can directly interact with various ship systems – the most regularly used were the torpedoes, which charge on a timer and for plot (and gameplay) reasons need to be manually fired when ready. But every terminal can be accessed, from shields to scanners, albeit few were actually required to be used in the demo on display. It is quite a complicated game to cover in a brief session, although thankfully Fabrice Clarke of Resonance was on hand talking people through things… and without the luxury of a tutorial to be taken at my own pace, it would have been daunting to work out things such as how to do the rewiring on my own (you are able to open floor panels and lay down extra cables, especially useful for putting more power to essential functions but not something that comes across as intuitive in a brief play). Indeed, a large part of my time was rotating between three functions – putting out fires before they spread too far, repairing damaged systems, and manually firing the previously mentioned torpedoes… and when the ship is getting seriously damaged in a fight, there is a lot of prioritising which of those is the most important to do first. You can zoom out for an overview of what needs doing, and where. The actual combat is apparently being simulated by the game, and so the demands being placed on you are not simply random requests to keep you busy but the result of how everything is working out… and at this point you can only hope that you really are the most important – if unappreciated – person on the ship to keep everything together. 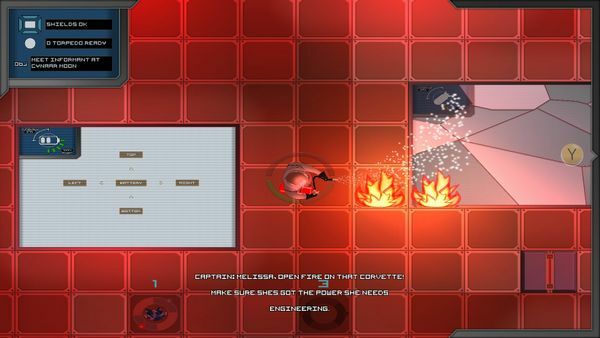 The full game is due to have an endless mode, with the ship travelling from fight to fight, and a more plotted mode with an endgame, albeit one that the development team were enigmatic regarding any further details on. 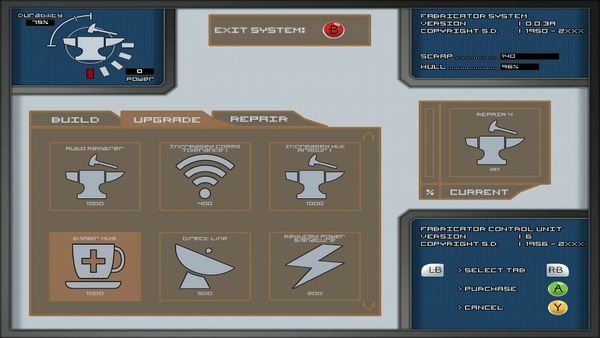 This will also allow you chances to improve and customise the ship, as destroying enemies gives you salvage that can be used to build extra systems in free hookpoints, or to improve the ones you have. Resonance Studios have Starship Mechanic currently on Steam Greenlight, along with a list of game elements they are looking to develop more – having a tutorial being top of the list with good reason! As mentioned, playing for only a few minutes on the show floor was not the best introduction to a game with as many areas to cover as this, and Resonance themselves acknowledged this. Partly due to this, a demo of the game of the game is due to be made available on IndieDB at the end of this week, to let players get a feel at their leisure and for the developers to get feedback in turn, something that also seemed welcome at the show. Starship Mechanic is currently on Steam Greenlight; it is also available for pre-order from its own webpage, and is expected to begin early access next month.